Naf Naf’s Shawarma was good, but not good enough to keep me coming back (especially since I have a Homestyle Chicken Shawarma on my site) but that soup. Oh my gosh, I am wild about it. I love it. I crave it. I can’t get enough of it (luckily it’s super healthy) and I want it all the time. So that day was a game-changer for me. 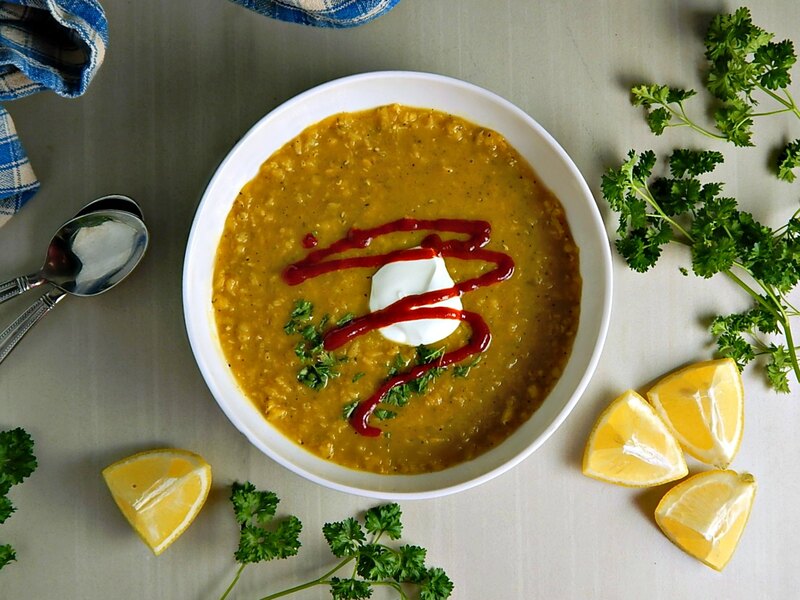 If you follow me, you know It’s no secret I love me some Soup, Chowder & Chili and I love this Thai Red Lentil Soup with Coconut & Curry, too. But the Naf Naf Lentil Soup is a whole different animal with a completely different flavor profile. It has just a bit of spice, a bit of curry and touch of cayenne; it’s not hot by any means but does have a little “personality” as my Dad would say. I like it just as is, with a squeeze of lemon. You might like a dash or two of hot sauce if you lean that way. Or you might like a dab of yogurt on top or maybe you’d like to swirl in a little of the Middle Eastern spicy herb sauce, Zhug. I’m no expert at anything, let alone the huge range and complexities of Middle Eastern flavors, so I googled and read and tried many different recipes in order to copycat this Naf Naf Lentil Soup. A lot of them were more complex but I think the key to the Naf Naf Lentil Soup is it is simple, easy to make and the flavor is (to steal a line from DDD) out of bounds. I took the majority of my recipe from Hardly Housewives, really just changing the amounts of liquid, the timing and tweaking the spices just a bit. I think I’m pretty close to the taste of the original, using the lentils I’m able to get; it certainly isn’t as pretty as Naf Naf’s soup. You’ll probably want to serve your Naf Naf Lentil Soup with some type of flatbread, pita or maybe Naan, just to fill out the meal. Check the store if you don’t make your own, or check with any Indian or Middle Eastern restaurant; some will sell packages for a pittance and you might get a much better bargain and much fresher bread than you will at the grocery store. You’re going to have this soup made in 25 minutes or so. I actually did a trial (because there is no such thing as too much of this lentil soup) one pot of soup on the stove and the other in the Instant Pot. The IP saved me about five minutes but I like being able, in this case, to watch the soup as it gets to the end so I can adjust the flavors, the liquid and get the lentils just how I like them. If you decide to use the IP, use 10 cups of water instead of 12 and set for high pressure for about five minutes. Then use the saute function to simmer to desired consistency and adjust seasonings and liquids as desired. I like those lentils to be soft but just a bit distinct and the soup to have enough liquid to be soupy rather than more like porridge or stew. You can adjust that to your taste. And watch the salt; while I think this soup is great just a bit on the salty side, the chicken broth you use might be a little salty on its own. Don’t add any more salt until after you’ve added a good squeeze of lemon. That lemon will brighten this soup and you may found that with the acid from the lemon, you can get by with less salt than you might think. I like this soup best with plain old grocery store yellow curry powder; the flavors really are on the simple side both at the restaurant and in this recipe. Upgrade that with a fancier curry if you’d like. If you think you might use it again, Sumac, a spice found in Middle Eastern cooking (and an ingredient used in my Ras el Hanout Spice blend) is a worthwhile add – it nudged the soup just slightly in the right direction, but I actually made and loved this soup before I thought to add a 1/4 teaspoon of sumac. I wouldn’t buy a whole jar of Sumac just for this small amount in the recipe, though. Use it if you have it. Lentils, like most beans and legumes, are so cheap and so good for you, they’re really a bargain. These are the merry little red lentils (which are really orange…don’t ask!) although you can’t tell it from the color of the soup. I can’t really find the yellow lentils in my area. Check in the bag and the bulk aisles for the best pricing. You can really use any kind of stock you wish in this soup; I prefer chicken stock (of course, use vegetable stock if you’re going meatless) and love to use my Homemade Turkey or Chicken Stock, and that puts this soup on the table for just pennies a serving. Use what you wish, though. I could never make enough chicken stock to get me through the amount I use, but I do watch for the big sales on it around the Lent and Easter sales and the Winter Holidays. You’ll pay about half price if you stock up then, but if you don’t catch those sales, check out Aldi or your buyer’s club. Heat olive oil in a Dutch oven, add onion and saute until softened, about five to six minutes. Add garlic, curry powder, cumin, cayenne and sumac, if using, and stir until fragrant, being careful not to burn. Add a little of the stock, a cup and a half or so, and stir together, then stir in the remainder of the stock. Add in the lentils, bring to a boil, reduce to a good simmer. Cook, stirring now and then until lentils are a the desired stage of doneness, 15 to 25 minutes, depending on whether you wish them to be soft and distinct or very soft and almost dissolved. Add the squeeze of lemon, salt to taste and garnish with cilantro or parsley. I’ll be sharing Naf Naf Lentil Soup at Fiesta Friday #271 hosted this week by Ai @ Ai Made It For You and Angie @ Fiesta Friday. This entry was posted in Click here for Bargain Meals, Click here for Fabulous Food Posts and tagged Instant Pot, Lentil, Middle Eastern, Soup. Bookmark the permalink. Oh my gosh, no!! I hoarded the last bit of it and told my son to stay away from it, lol! !